Providence Mount St.Vincent in Seattle is home to more than 400 elderly residents. It is also home to a preschool. It's called the Intergenerational Learning Center, and whoever thought of it is a genius. Five days a week, the residents and children come together and participate in planned activities that are common in preschools: dancing, art, storytelling, or just hanging out. Evan Briggs, an adjunct professor at Seattle University, was so impressed with the model she decided to make a film about the learning center in hopes the knowledge of it would help the model catch on. She told ABC News the idea was "genius" and "well within our reach." She is funding the movie completely on her own, with the help of a small Kickstarter campaign. Briggs said the nursing home residents did a "complete transformation in the presence of the children." She told ABC, "moments before the kids came in, sometimes the people seemed half alive, sometimes asleep. It was a depressing scene. As soon as the kids walked in for art or music or making sandwiches for the homeless or whatever the project that day was, the residents came alive." Briggs titled the film Present Perfect, because it speaks to the idea that these two groups of people -- preschoolers and the elderly -- only have a few years to overlap in their lives. 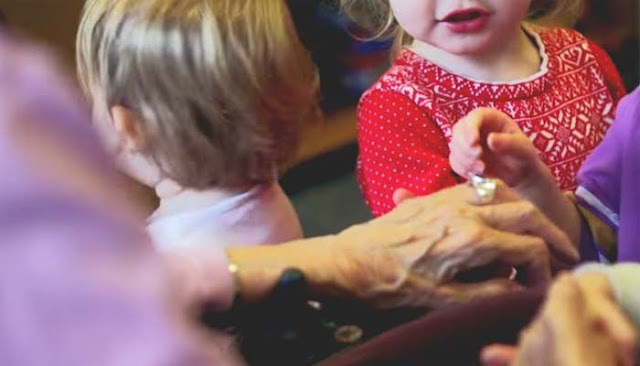 The preschoolers have their whole lives ahead of them and virtually no experiences, the elderly have rich histories and only a few years left. They come together to share that unique time in one's life -- the beginning and the end. It's such a beautiful idea. The film opens with the scene of a boy trying to recite his name to an old man who is hard of hearing. He patiently repeats his name over and over, while the man repeatedly fails to quite grasp what it is. The boy is present and patient -- not rushed, annoyed, or bothered by the fact that the interaction is strained. Briggs says on her Kickstarter page, "Stepping into most any nursing home, it's hard to ignore the sense of isolation one feels on behalf of the residents living there, and even harder to reconcile that with the fact that old age will inevitably come for us all. In our fast-paced, youth-obsessed culture, we don't want to be reminded of our own mortality. It's easier to look away." Well, you won't be able to look away from this trailer. What an amazing story.